I grew up to the Broadway soundtrack of The Pajama Game—“Steam Heat,” “Hernando’s Hideaway,” and “There Once Was a Man” were my mother’s favorites. 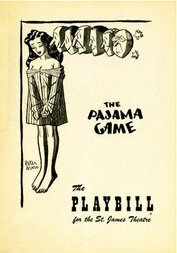 Going through my parents’ collections of ephemera, I recently found a playbill for The Pajama Game when it was playing at the St. James Theatre on Broadway. Did my parents see it in 1954, the year it opened? Since the musical was enormously popular, running for 1,063 performances, the playbill could conceivably be from 1955 or even 1956. But I like to think they saw it fresh, soon after it opened, when it was the hottest ticket on Broadway and people were hearing the name of choreographer Bob Fosse for the first time. For the next few months, the focus of 21 Essays will be on the year 1954. Dwight D. Eisenhower was President, Queen Elizabeth II was a young adult monarch, Joe DiMaggio married Marilyn Monroe, and Bill Haley and His Comets recorded “Rock Around the Clock.” Thinking about the year (still six years before my birth), I realize with a shock that I’m now approximately the same age as my grandparents would have been in 1954. As for my parents, they were settled in to a comfortable life on Cooper Street in Southampton, New York, enjoying their childless freedom and the occasional jaunt into New York City to catch a Broadway show. Most of these would have passed unnoticed by my parents. The Southampton Theater showed Hollywood movies, not the new international cinema that would have required a visit to the art houses of Manhattan to follow. Of the foreign movies, only Godzilla received a major US release, and that was in a Hollywood recut that was still two years away. In the book publishing world, Tolkien’s The Lord of the Rings took even longer to find its audience. As for The Pajama Game, yes, I love it… but I think I’ll hold off discussion until we reach the movie version of 1957, happily filmed with most of the original Broadway talent intact. Even without The Pajama Game, there’s plenty from 1954 to keep me occupied with my mini-essays for many, many weeks.